One grand Heavy Duty is een poets die speciaal ontwikkeld is voor het herstellen van zwaar ge-oxideerde lakken..
Kan gebruikt worden in combinatie met een poetsmachine. 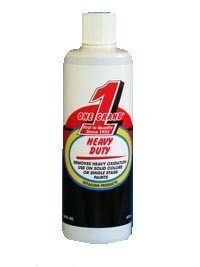 "Heavy Duty Cleaner" is designed to be used with a buffing machine to cut and remove severe oxidation or cut through a wet-sanded finish after color-sanding. "Heavy Duty Cleaner" can be used simultaneously with "Glaze" to tailor the perfect blend of cut to restore either of the above mentioned surfaces to a scratch free & clear finish prior to finish polishing & waxing. "Heavy Duty Cleaner" is recommended for older, vintage single stage paints or re-paints with plenty of clear coat surface. "Heavy Duty Cleaner" is not recommended for the new factory clear coats-instead we suggest "Special Touch" to restore them. Remember… for the ultimate restoration, follow with "Glaze" or "Omega Glaze" and a coat of "Blitz Wax".